Little Bulb Theatre returns to Bristol Old Vic with a slick new version of their 2013 performance of Orpheus, originally commissioned for Battersea Arts Centre’s Grand Hall. A talented cast of 8 players re-tell the tragic love story of Orpheus and Eurydice through an astonishing array of musical offerings including classical Debussy, hot jazz and opera. The stage is set for a 1930s cabaret style evening, enthusiastically compared by Yvette Pepin (Eugenie Pastor) who soon introduces us to the legendary gypsy jazz musician Django Reinhardt (Dominic Conway). 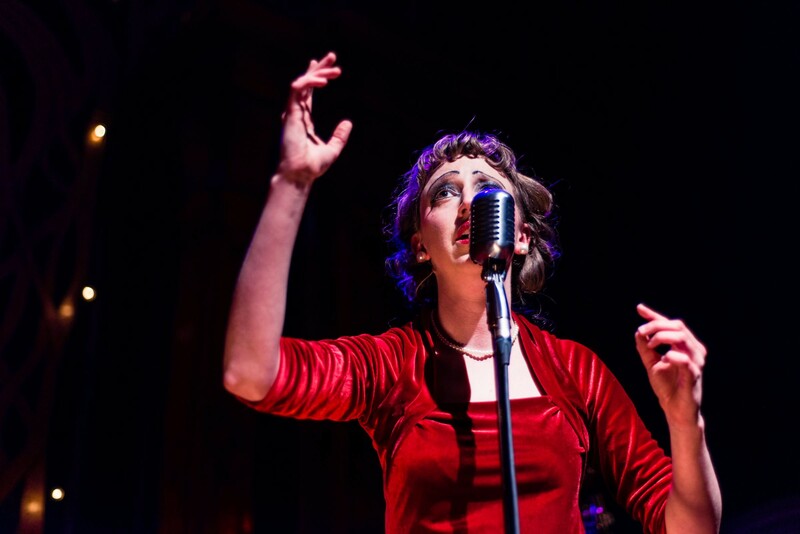 Pastor manages a superbly fun, French accent and flair throughout her performance as she shifts characters from hosting the cabaret evening to playing Orpheus’ love interest, Eurydice. For those who may not be familiar with the classical Greek myth of Orpheus (the poet and musician known for playing so beautifully even the trees and rocks moved to be closer to him) a musical prologue sung by The Triplettes (Miriam Gould, Shamira Turner and Clare Beresford) sets the audience up with a quick overview of what to expect from Django and Yvette’s re-telling of the tale. And with this prologue comes the realisation that we will not only be enjoying the talent of brilliant musicians, but of stunning vocalists as well. The trio are fascinating to watch as they flutter across the stage in beautiful costumes and masks, successfully managing to play and move to the comedic timings while also delivering consistently striking musical performances all evening long. The vast amount of energy this cast must use to achieve all that is happening on stage at once is mind-boggling. 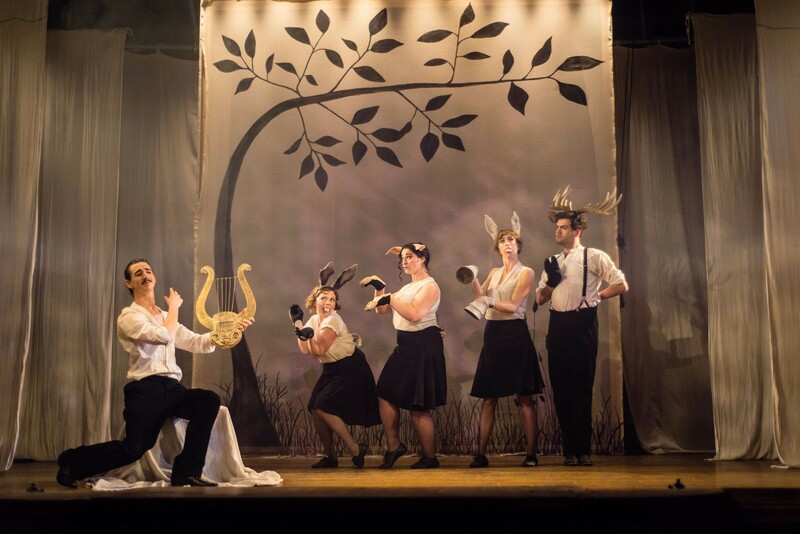 From the perfection of the musical conductor, Master of the Keys, Charles (Charlie Penn) to the bizarre woodland creatures, the cast simply do not miss a beat. The slapstick physical comedy of the Strong Arms, percussionist (Tom Penn) and Clarinettist (Alexander Scott) was quite notable as they, too, ran between playing their instruments to flitting about the stage, playing various roles in addition to stagehands, and eventually also playing the characters of Hades and Persephone when Orpheus visits the Underworld to bring back his beloved Eurydice. Most of the performances were sparse in dialogue (Conway actually mimes both his characters), yet rich in atmosphere. While often absurd, the production is engaging and the quality of the music far surpasses expectations. The whole of the two hour performance was vibrant; a feast for both the eyes and ears. There was one scene, however, that stood out among the rest – a surprising turning point that added a truly emotional edge to the production was Penn’s solo as Persephone. An original composition by the company, it was a stirring, remarkable moment that took this production from being fun and entertaining, to truly beautiful and moving. Time is running out to see this production at Bristol OId Vic, as after 26th September Little Bulb continue north on their tour of Orpheus. See it while you can.